Got a bike? Tote your Tyke! The Tyke Toter front mount child bike seat is the perfect solution for you and your growing child. Intended for children ages 2-5, it takes over where other front mount child bike seats leave off. Tyke Toter child bike seat is adjustable higher or lower on your own bike’s seat post to accommodate children as they grow and until they are old enough and big enough to ride along with you on your bike rides. 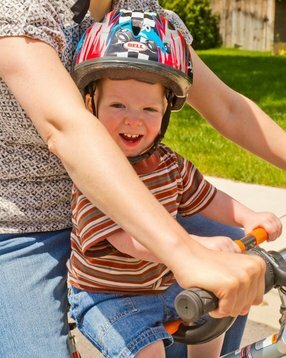 Tyke Toter front-mount Child Bike Seat is lightweight, simple, extremely portable, and centers your child right between your arms during your bike ride together for security and safer handling. 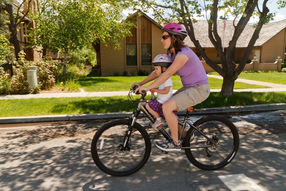 The concept of Tyke Toter is the most interactive bicycle ride for you and your child. 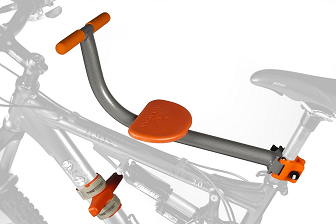 Attaches with a quick-release mechanism right onto your bike's seat post and is on or off in less than a minute! There is no hardware left behind, and no tools needed. Open the box and be out riding in just a few minutes. Invented by a dad for his own child, this front-mount child bike seat is the perfect solution for the most fun, safe and interactive bike ride with your little one. Your child will LOVE riding this with you!